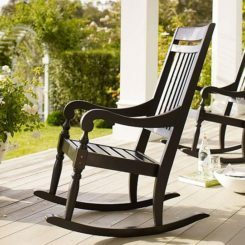 For a long time the rocking chair has been associated with that image of a cute grandma slowly swinging back and forth on the porch, with a knitting basket next to her and a sleepy cat in her lap. 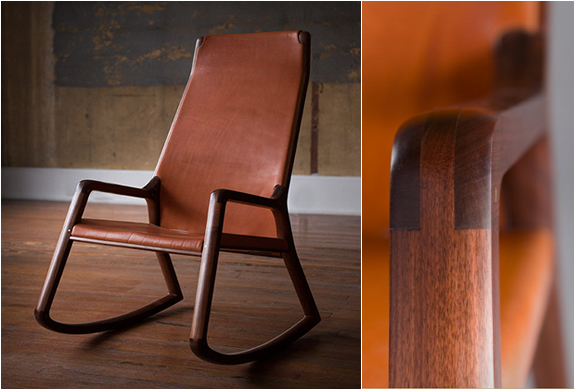 We’re gradually making the transition from a familiar design to that of a modern rocking chair that reinvents a classic. A bunch of gorgeous reinterpretations of the rustic rocking chair are already on the market and more will follow. 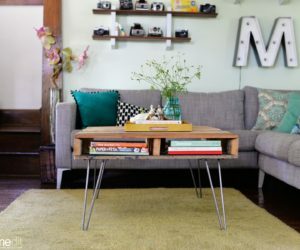 This is no longer a piece of furniture destined for cozy yet old homes but instead meant to be successfully added to modern and contemporary decors. 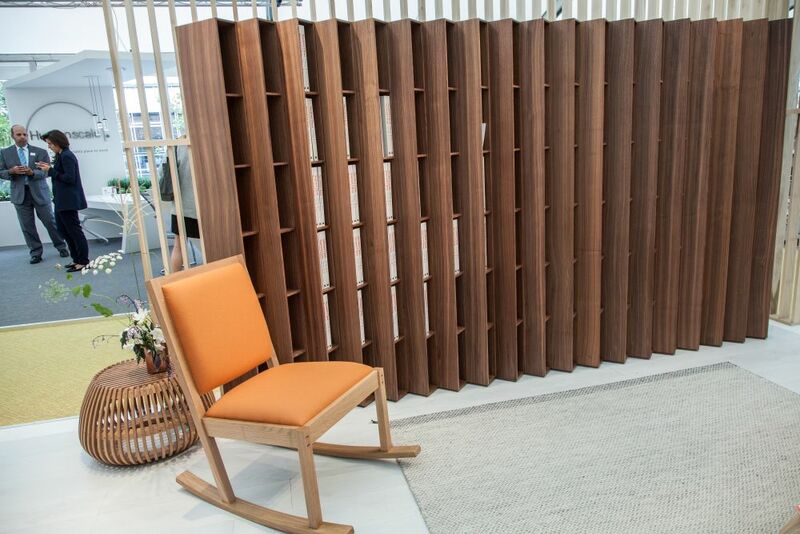 Did you ever think that a rocking chair could be folded for easy storage and transport? It’s not an idea associated with this furniture piece, at least not until recently. 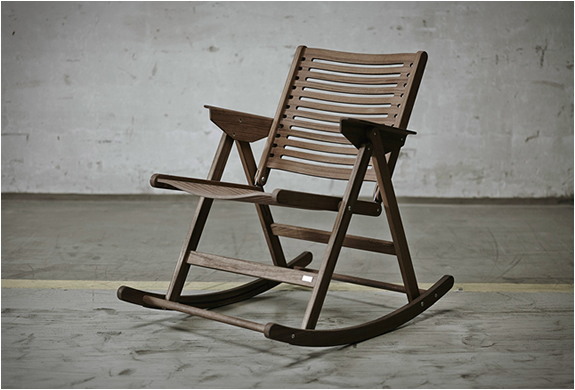 A young designer by the name of Anker Bak attempted to change our perception of what a rocking chair should be by creating a minimalist and, most importably, foldable version of the piece in collaboration with Carl Hansen & Son. 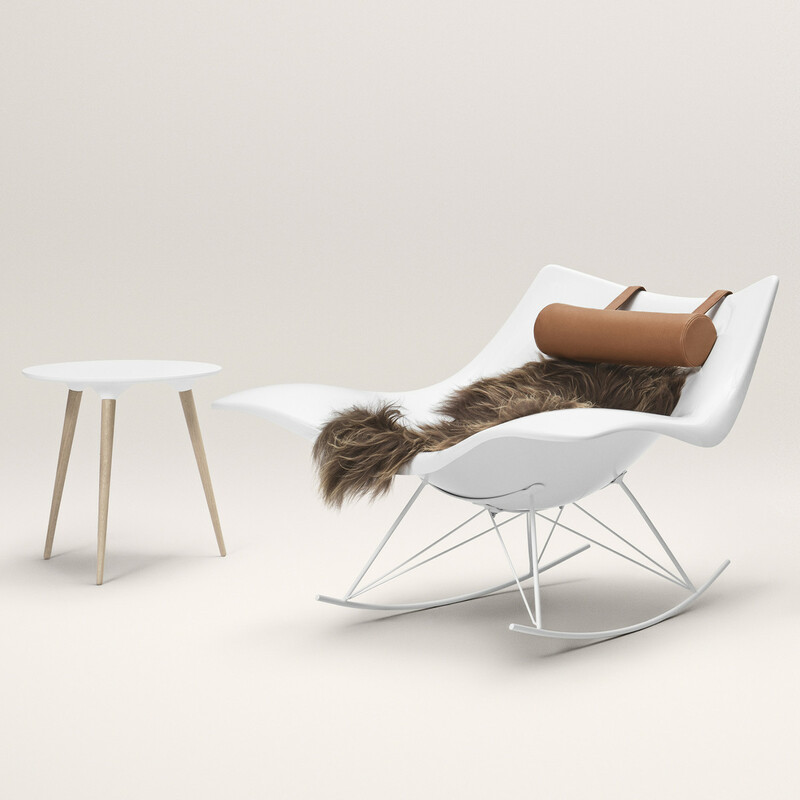 The Yvetta rocking chair is also a minimalist interpretation of a traditional concept. This is a modern rocking chair that has a frame made of locally-sourced solid beech and a one-piece seat that’s attached to the legs with the help of two wooden screw pegs. If you ever wished a rocking chair was bigger so two persons could fit on it, this is the design that makes it all come true. 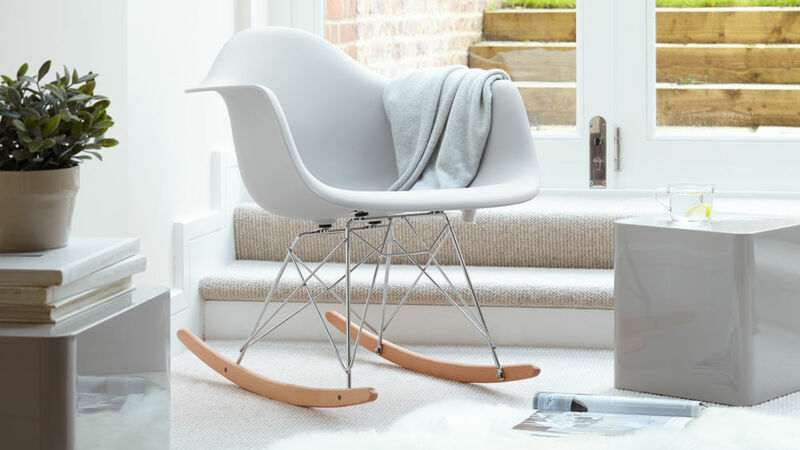 The simple design of the Gillespie rocking chair is definitely elegant but it’s something else that makes this piece special: the fact that it comes in two sizes, one of which is big enough for two. The Rocking Knit takes rocking and knitting to a whole new level by combining them in a unique and unusual way. 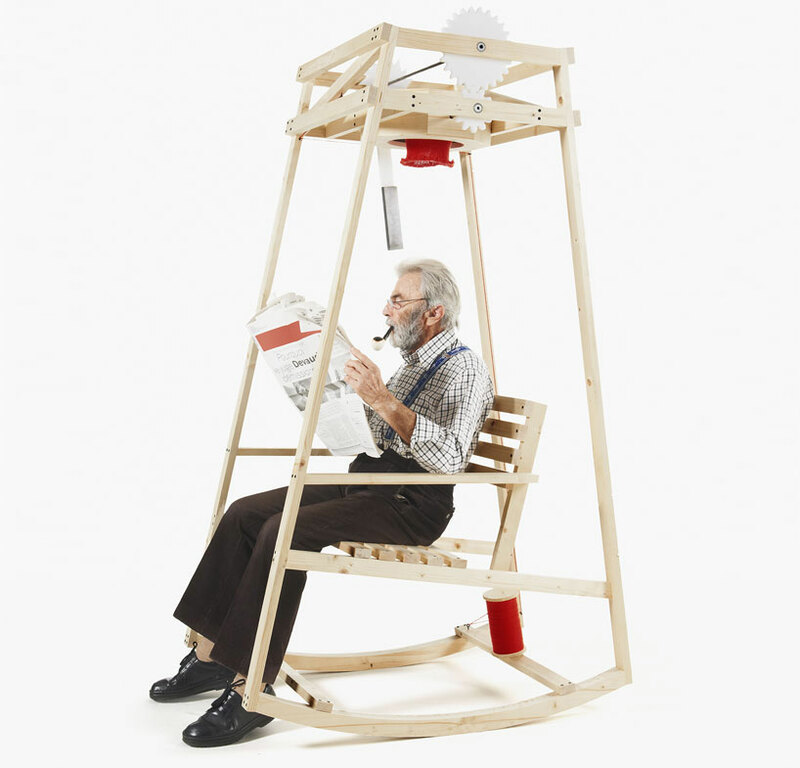 This is rocking chair with a built-in mechanism that actually knits a beanie for the user, as it swings back and forth. It’s a pretty cool idea and one that definitely has what it takes to make this a very quirky and interesting piece. It was a project by two Ecal students for the ”low-tech factory” exhibition. The Great Egret chair was shaped by studio sayar & garibeh, the goal being to give it a refined and graceful appearance inspired by the bird with the same name. 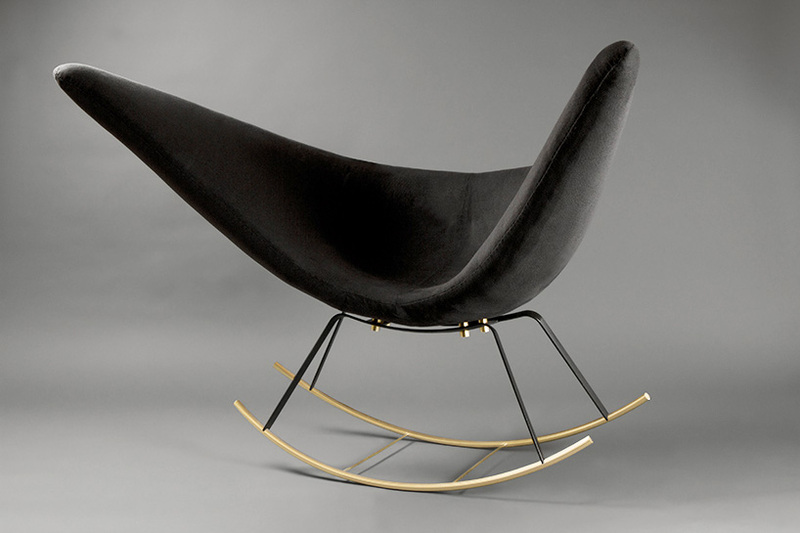 Its base is made of metal and its thin construction contrasts with the seat’s elongated form that mimics two wings. 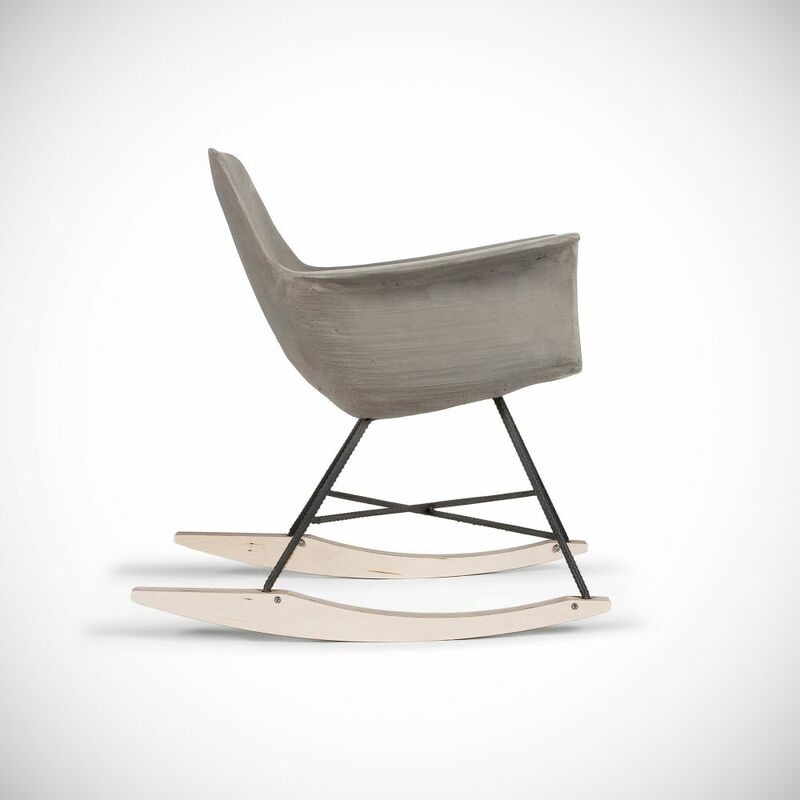 A rocking chair without legs…that’s quite unusual and definitely very interesting. But how would such a design work? 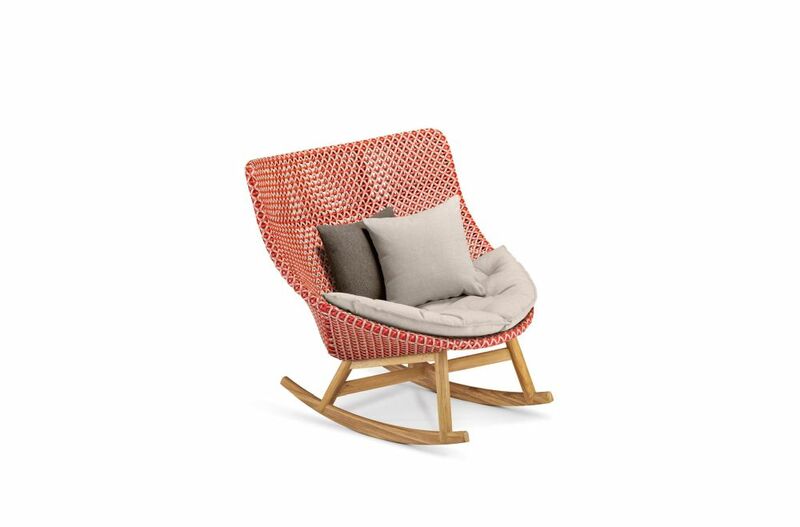 The Fedro woven outdoor rocking chair shows us. 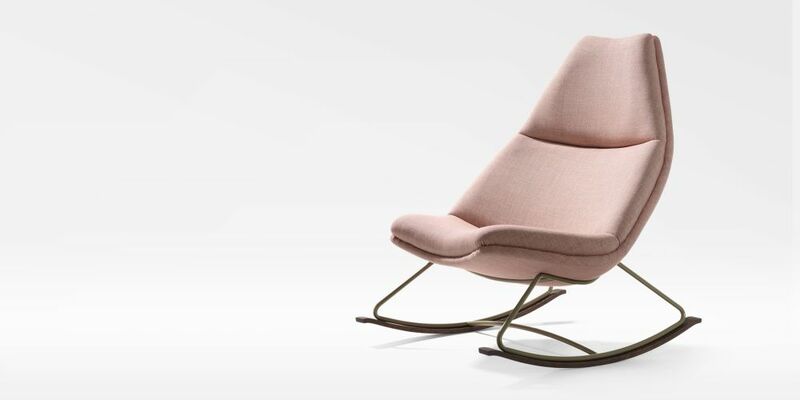 This is a chair designed by Lorenza Bozzoli for Dedon. It’s basically a chair seat without legs which lets the user balance and move using the arms and legs. The shape of the seat has been adapted to be more similar to a lounge chair for increased comfort. 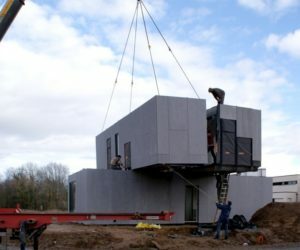 It weighs around 30 kg and has a base and frame made of carbon-fiber reinforced concrete. That’s makes the Swing rocking chair unusual to say the least. Obviously, it would be practical to pick a permanent spot for the chair given how heavy it is. Don’t worry about the floor though because the base is covered with a sheet of leather. 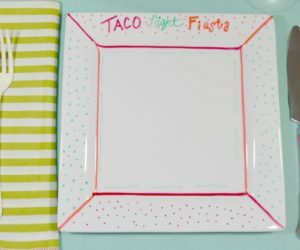 This was a limited edition design of only 100 pieces. 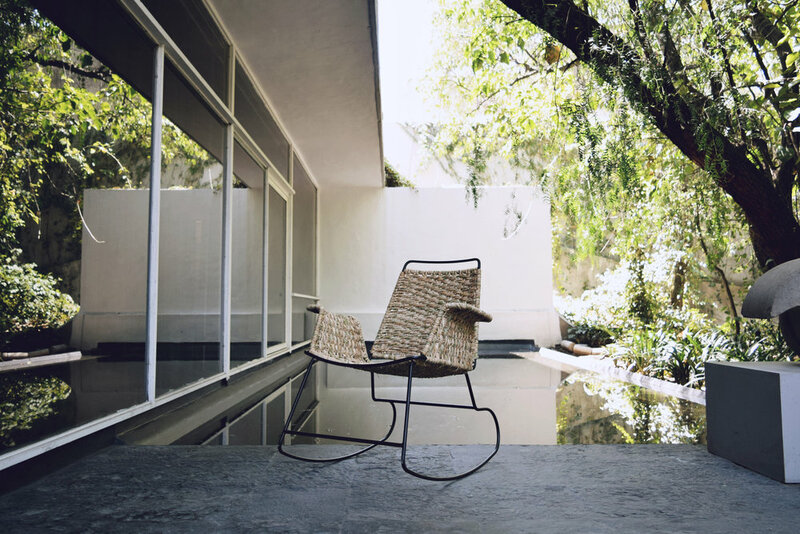 The Unam rocker is also a modern reinterpretation of the classical rocking chair but with more familiar details. It has arched legs and armrests and a very cozy and friendly-lookking frame made of wood. All the rounded edges and the lack of sharp lines and angles make this a very comfortable-looking piece. 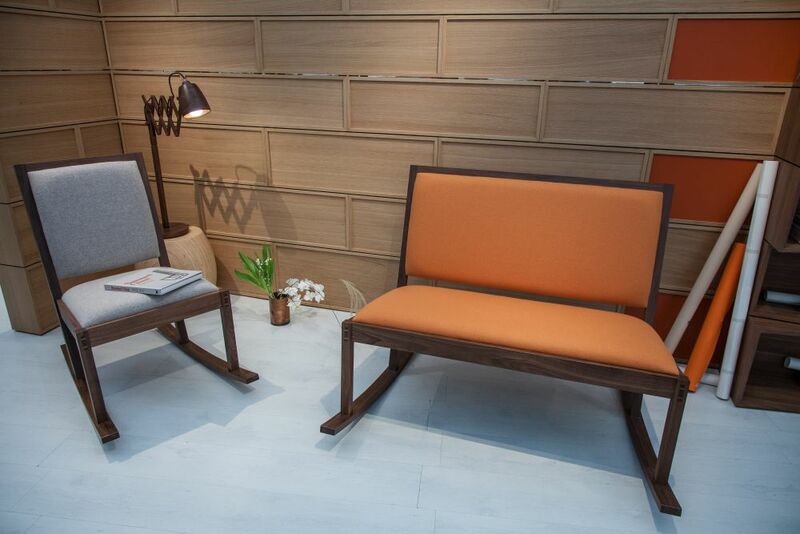 What we also like about it is the combination of simple wooden elements and a woven back and upholstered seat. 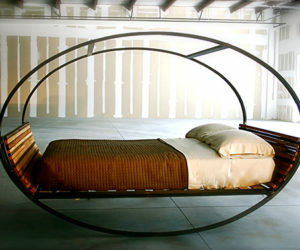 The inspiration for the Cala rocking chair comes from an interesting source: suspended bridges. The chair’s frame is a system of stainless steel rods that ensure maximum comfort and stability as the tension in them changes. Visually, the chair has a very sculptural and graphical look with a bit of industrial character. 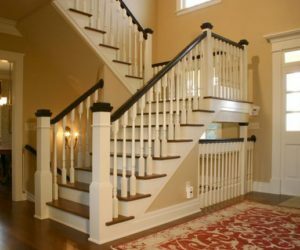 Some classic designs are so beautiful and their timeless elegance is so powerful that they never really go out of style. 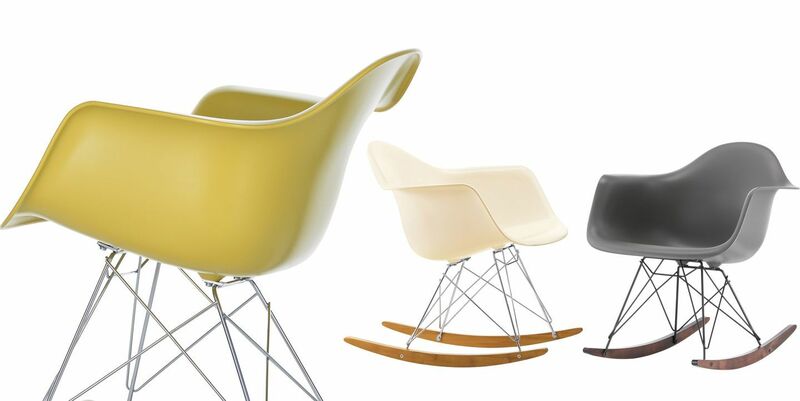 The chairs designed by Charles and Ray Eames usually fit into this category. 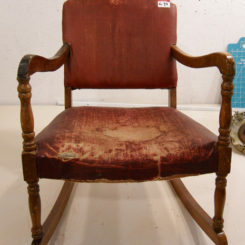 A particularly interesting example is the chair known as RAR or Rocking Armchair Rod Base. It’s a classic plastic chair set on wooden runners. 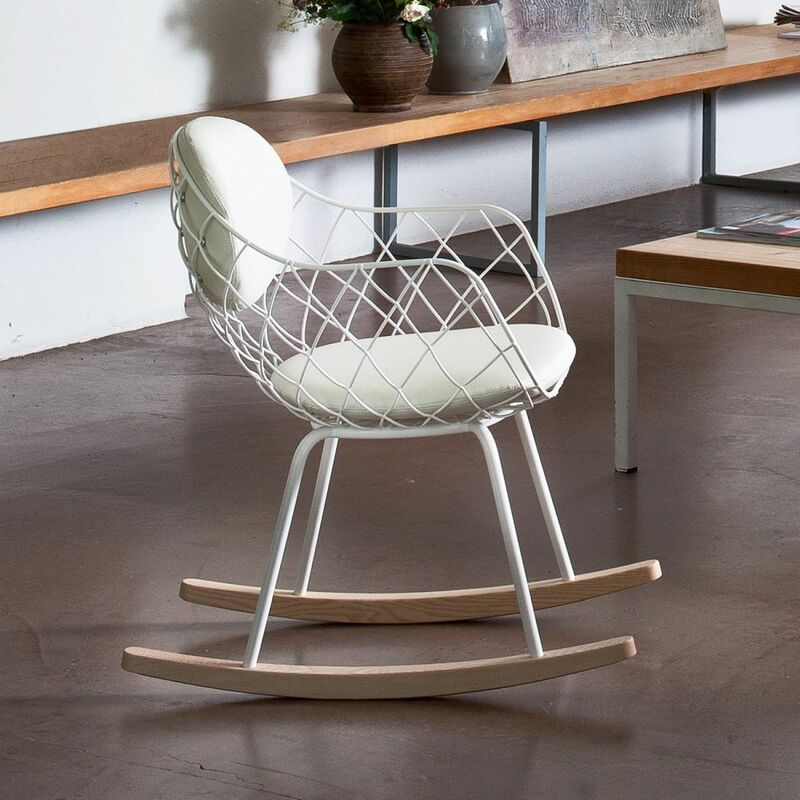 This is the Cleat Knockdown Chair, a modern rocking chair designed by Tom Chung who found inspiration for its form and general design in the harbors of Vancouver and Stockholm. 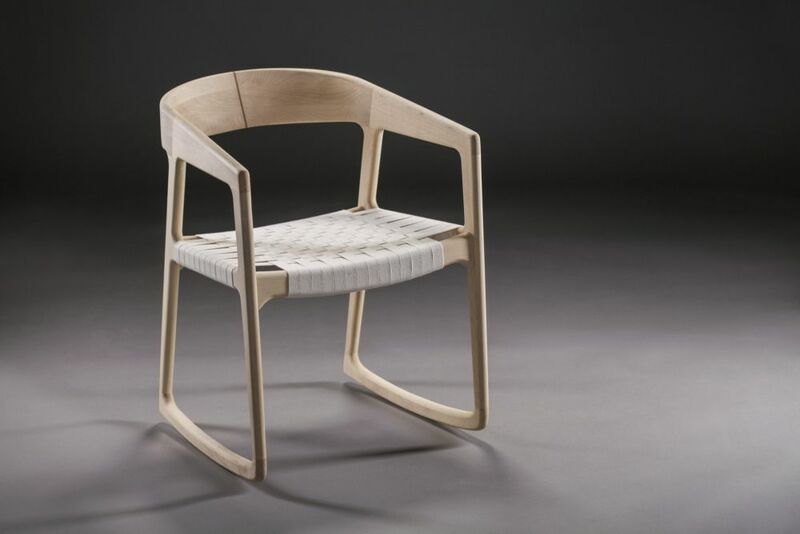 The chair’s frame is made of solid birch and the components are connected using rope. 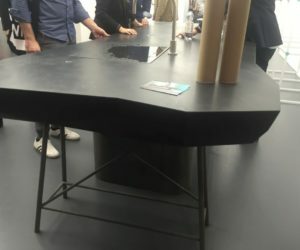 This is a piece that was presented at the 2017 Salone del Mobile edition. Designed by Christophe Pillet, the Summerset Rocking Armchair is simple-looking, refined and elegant, featuring a very slick steel grid frame and a wooden base. It was designed specifically for outdoor use, with a special protective treatment that allows it to be used near pools and water in general. 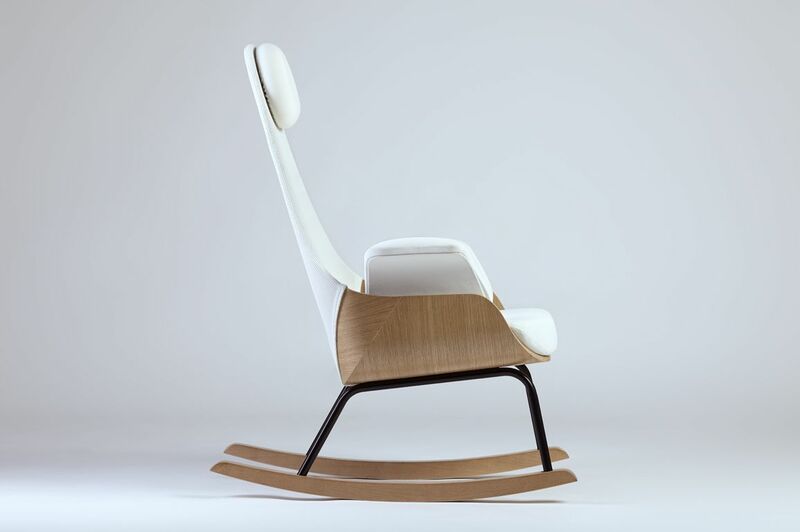 Meet Nana, a rocking chair with a design inspired by the timeless Eames Lounge Chair. 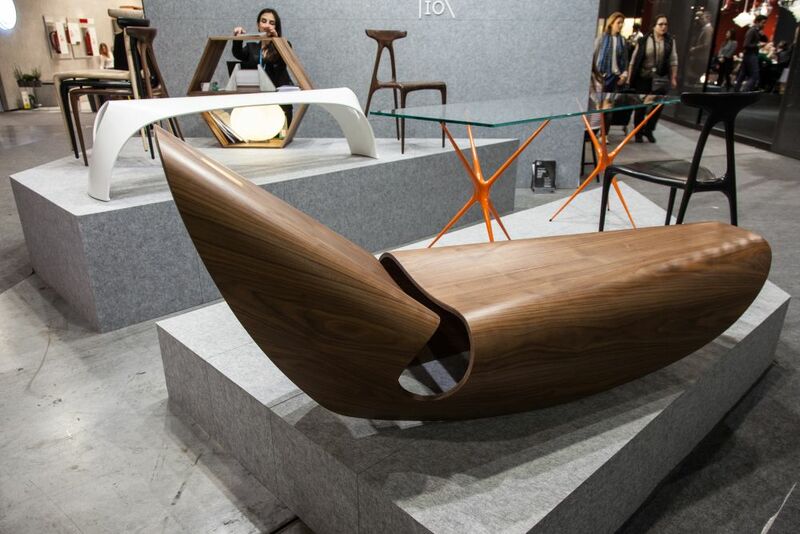 It’s a very special piece created by Alegre Design Studio and its design is simple, refined, modern and very elegant. It’s a perfect nursery rocking chair thanks to its specially shaped seat and shell and the base which ensures a gentle rocking motion that soothes and relaxes its users. Kids like rocking chairs too. In fact, they find them very fun, even those that are too big to be comfortable for them. 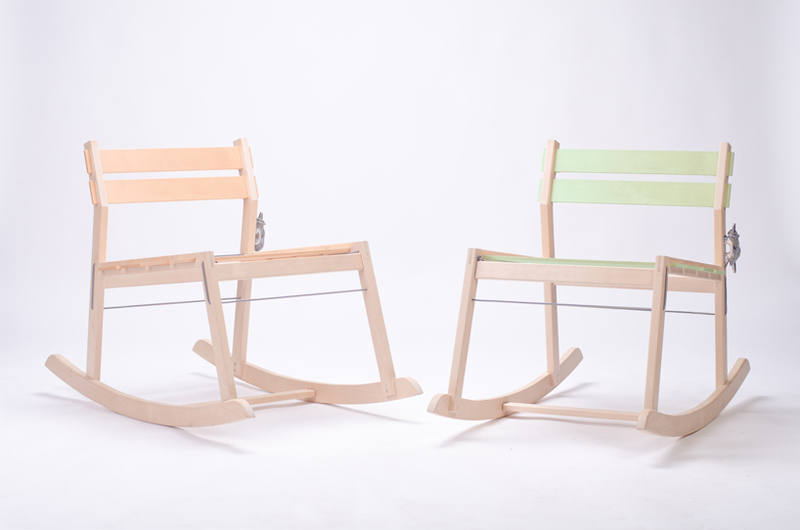 The AMM Rocker is a chair designed specifically with kids in mind. 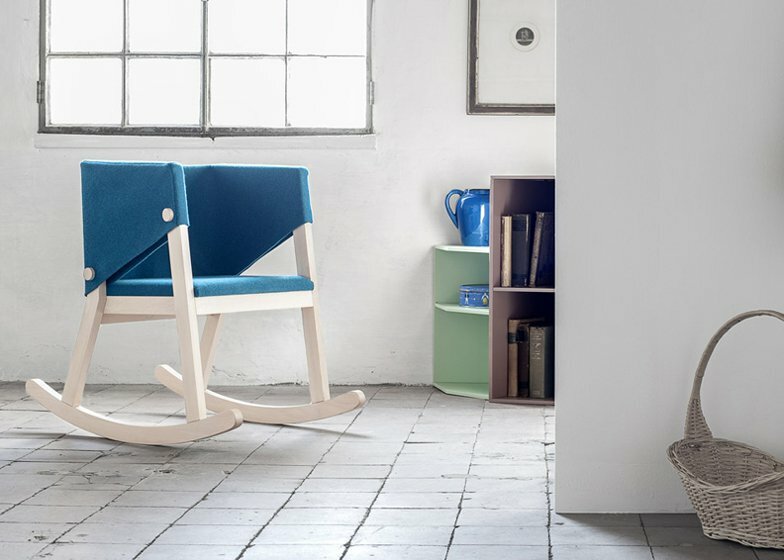 It’s small, lightweight and comfortable and its design is casual without being too childish, combining a wooden frame and a seat and backrest made of woven strips of organic felt. 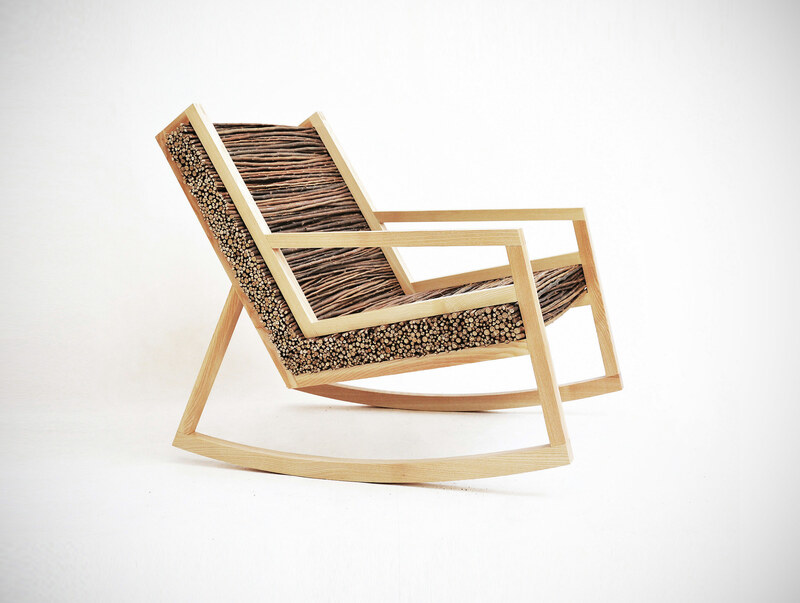 This rocking chair has a design inspired by the fashion industry. It’s the creation of Brendan Gallagher and combines a solid walnut frame and an upholstered seat. The interesting part is how these elements are connected. The seat is attached to two wire mech panels that fill the two halves of the wooden frame. The design of the Double Position chair is simply mesmerizing. This exquisite piece designed by Alex Petunin is made of wood and has a very fluid and organic form, with three cut out holes in their frame that reveal a colorful painted interior. 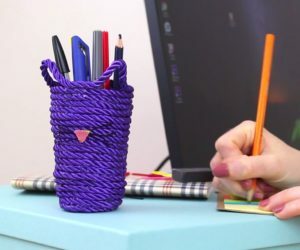 The cool thing about this piece is that it comes with two small and colorful legs, one of which can be removed in order to transform the piece into a rocking chair, allowing free movement. A lot of people enjoy and value their privacy, especially in open or shared environments. 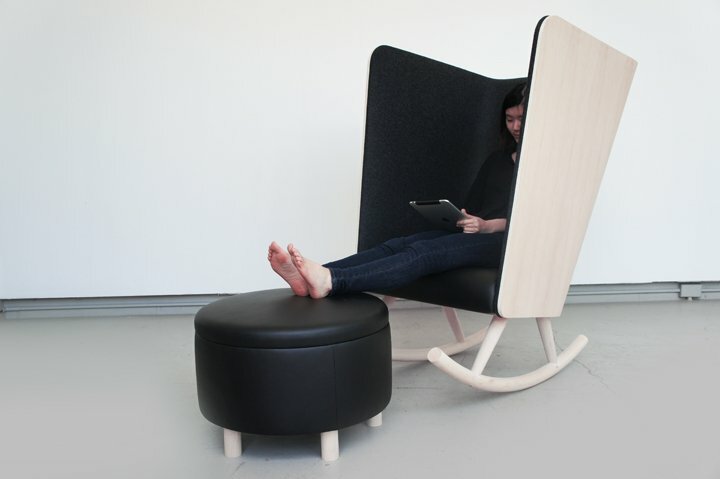 It’s for this type of people and spaces that Kyle Fleet designed the Private Rocker. 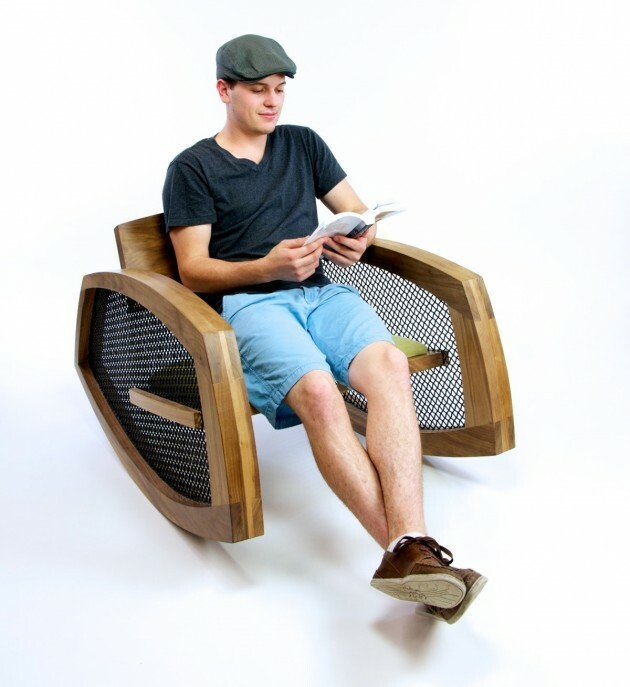 This is a modern rocking chair with a high backrest and side panels that wrap around the seat forming a shell. Only the front is open. You can pair the rocking chair with an ottoman for an even more comfortable experience. 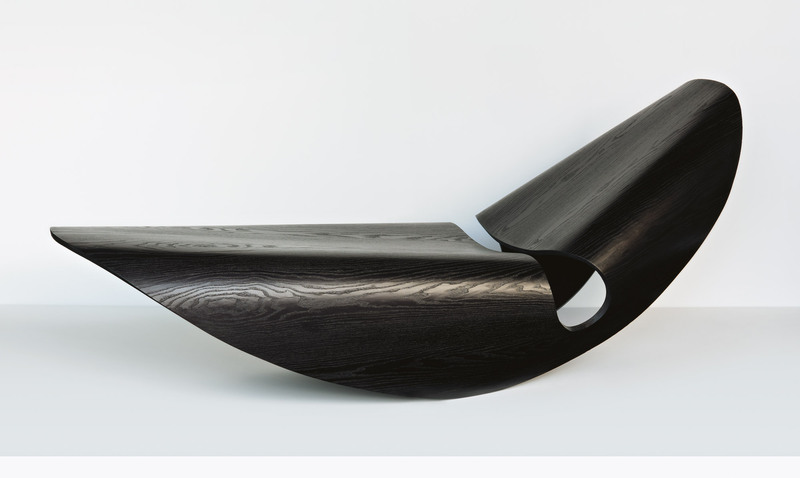 “What is this beautiful and abstract sculpture?” you might wonder…and the answer to that question is an unexpected one: a rocking chair. 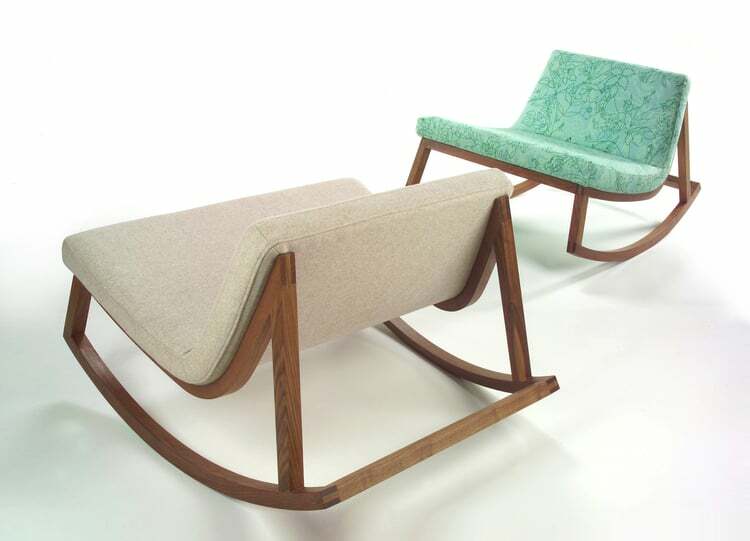 Unlike other similar products which frame a sled base or curved legs and a separate seat, this one has a continuous and fluid form, as if it was carved from a piece block of wood. it’s called the Ocean Rocker III and it’s meant to be simple, exquisite and an homage to the pure and rich beauty of the material from which it’s made. 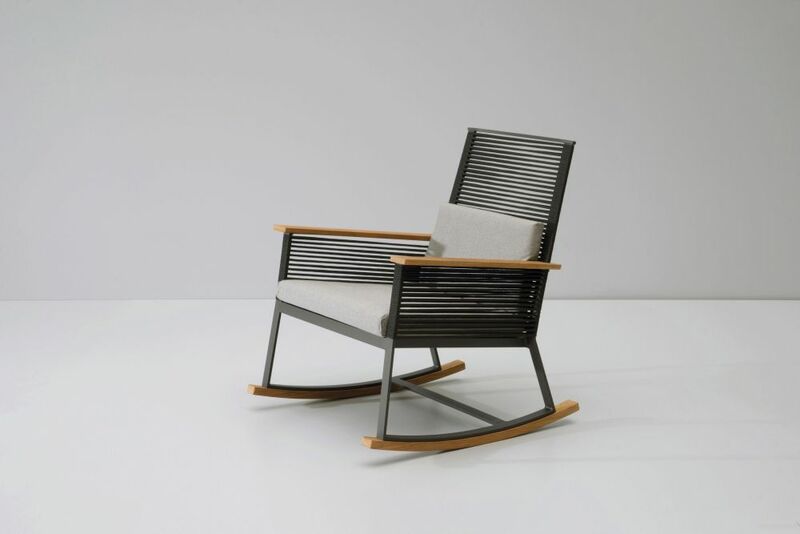 The First Rocking Chair designed by Fien Muller and Hannes Van Severen is a hybrid that combines the pure and straightforward simplicity of industrial design with the breezy and casual nature of a beach cottage. 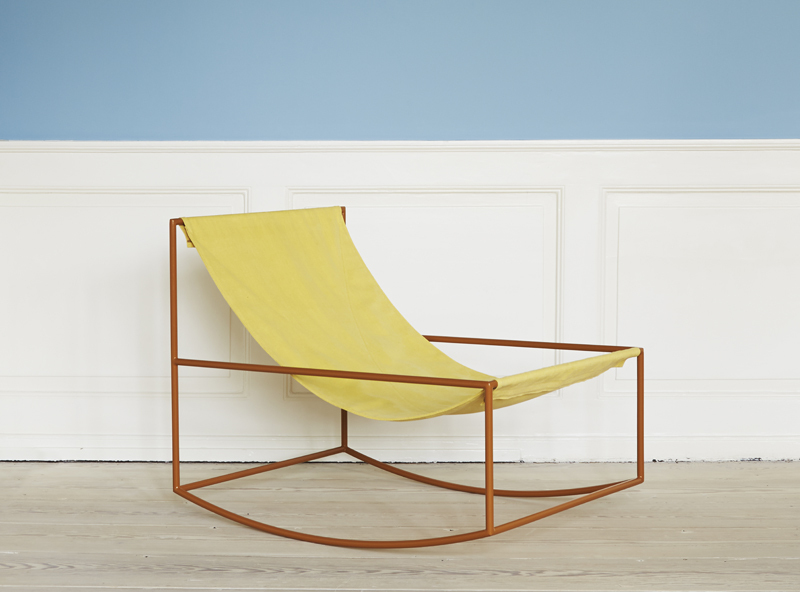 It features a slender metal frame with a curved base and a fabric seat available in bright and cheerful colors. 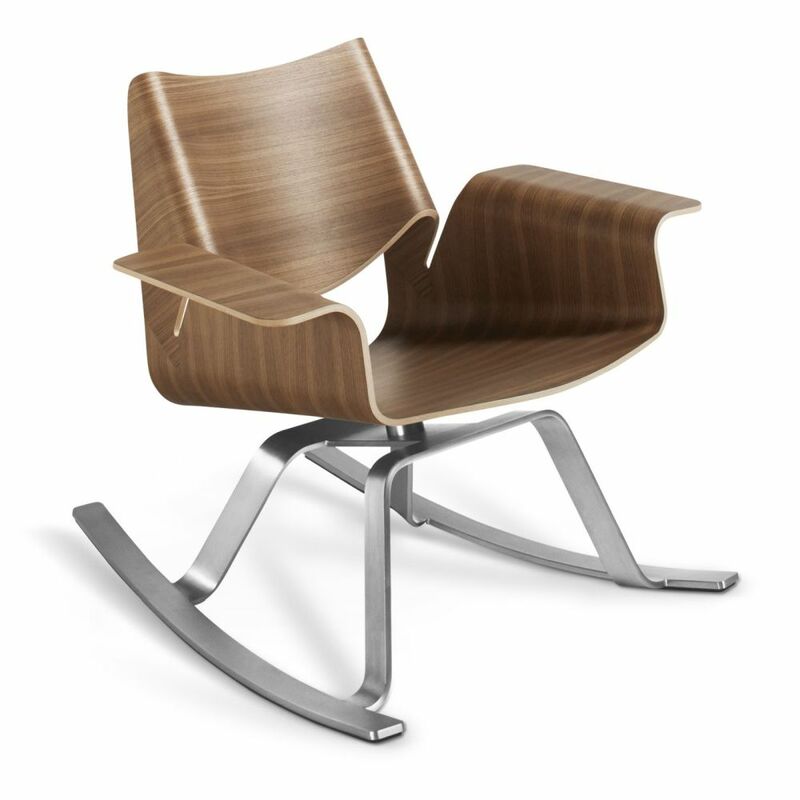 Speaking of hybrid designs, the Camila rocking chair is also an interesting case. Its design is a combination of old and new, a mixture of traditional elements adapted to suit a modern environment. It’s been stripped of all unnecessary elements in order to ensure a simple and pure design that emphasizes the materials, forms and textures used. 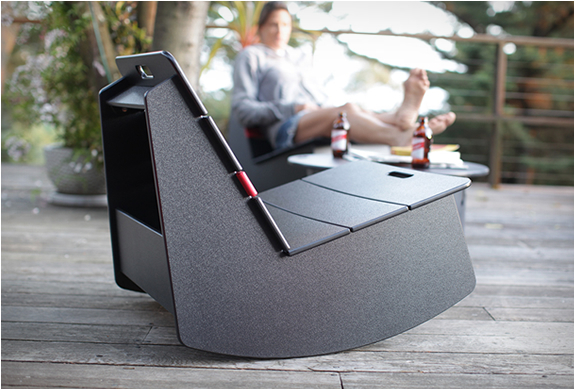 The GT rocker is a combination between a lounge chair and a rocking chair. Its design includes a powder-coated solid steel frame with felt stripes on the bottom for protection when used on hardwood floors. The frame holds three cushions panels that make up the seat and backrest. The fabric upholstery is available in four colors. 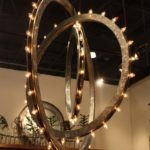 Some designers take things on a whole new level and reinvent a piece of furniture up to the point where it becomes something else. 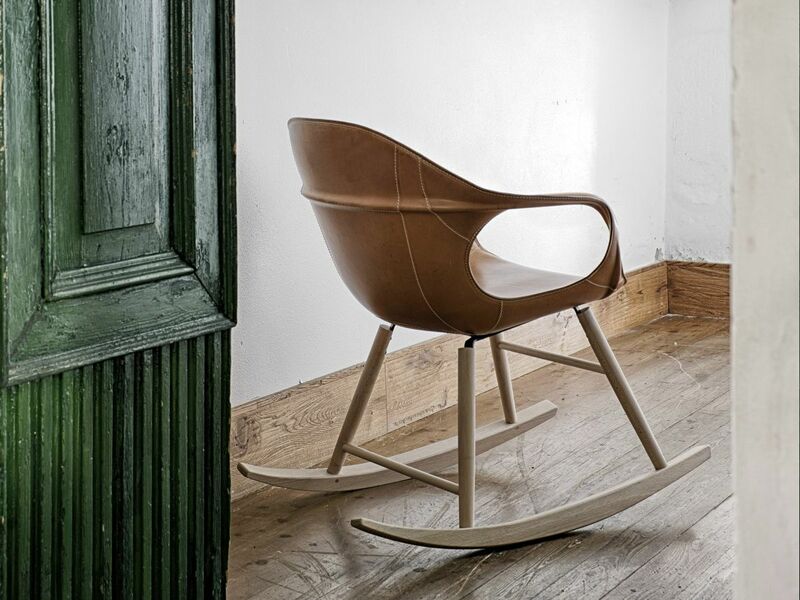 The Racer Rocking Chair could be one such example. 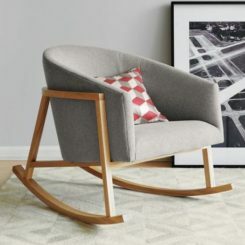 This is a modern rocking chair that’s made of 100% recycled plastic and its design is meant to mimic the look of vintage racing cars, hence the color options and the stripes but most importantly the open storage trunk in the back. 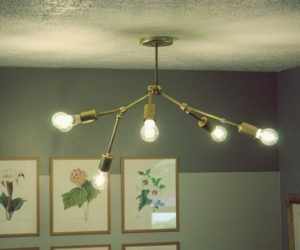 Other times designers choose to keep alive the character of the classic piece that inspired their new and unique creations. For instance, the Rex Rocking Chair is a piece that transitions from traditional to modern without extensive modifications to the design and character of the original concept. 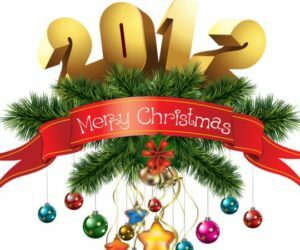 Its design is elegant and stylish as well as very versatile. 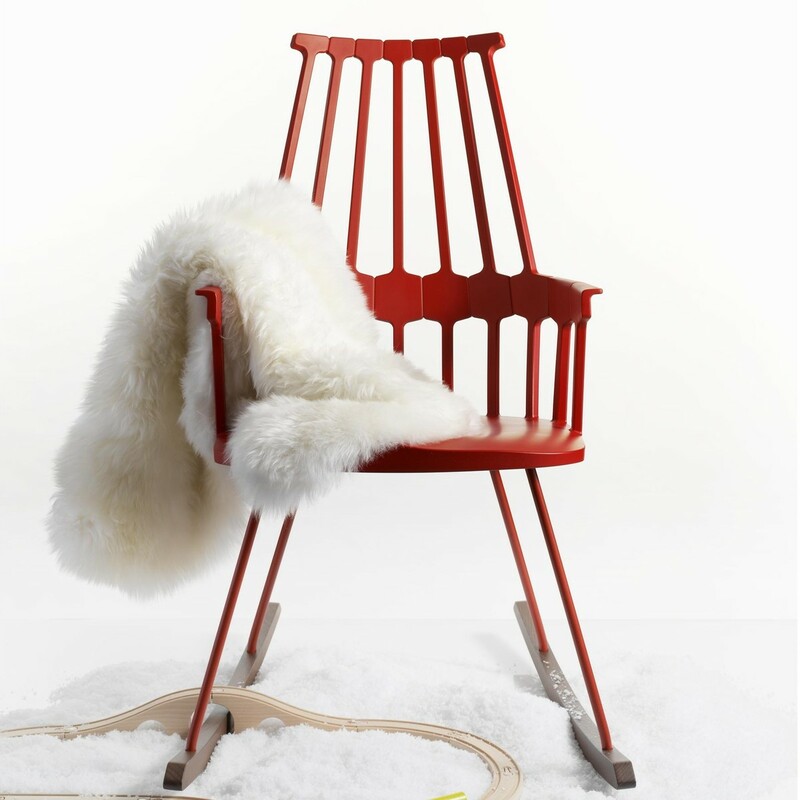 The classic Adironback Chair that we know and love also comes in a rocking version. The transition from lounge chair to rocking chair was simple given the already laid back and relaxing nature of the design. The main difference between the two versions is the base which, in this case, curves gently and complements the rest of the frame seamlessly. 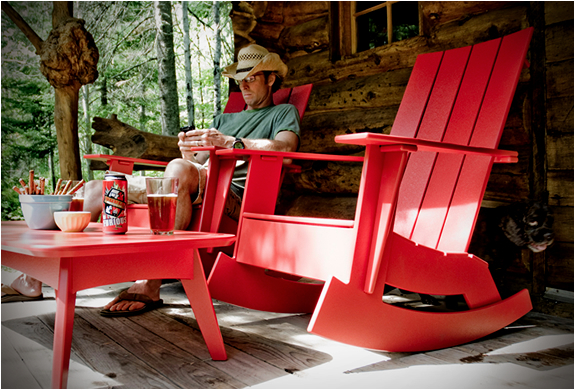 Believe it or not, the Lookout Mountain Rocker was continuously produced for more than 30 years. 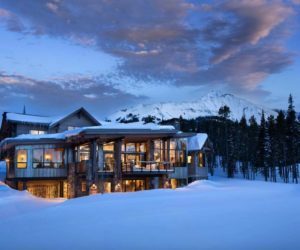 This shows the timeless nature of its design and its ability to adapt and to enver go out of style, no matter how many trends have come and passed over the years. This rocking chair has a wooden frameand fully suspended seat and back covered in hand stretched saddle leather. Sometimes a designer finds a way to completely refresh a furniture piece by changing a single basic thing about it, like Tomáš Vacek who offered us a new way of looking at the rustic rocking chair. Taken separately, both the ash wood frame and the numerous willow branches that fill its seat and backrest are not impressive or interesting but put them together and suddenly they make a mind-blowing duo. The result is the Haluz Rocking Chair. 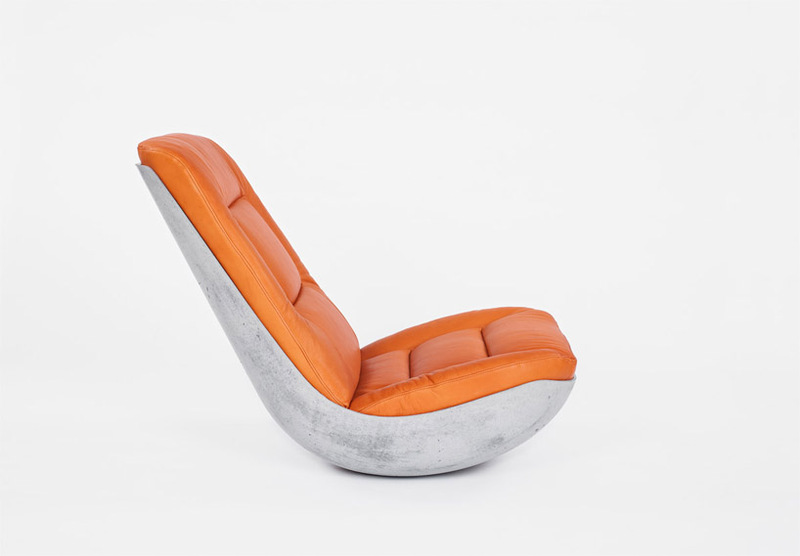 Could a chair made of concrete be comfortable, practical and good-looking? 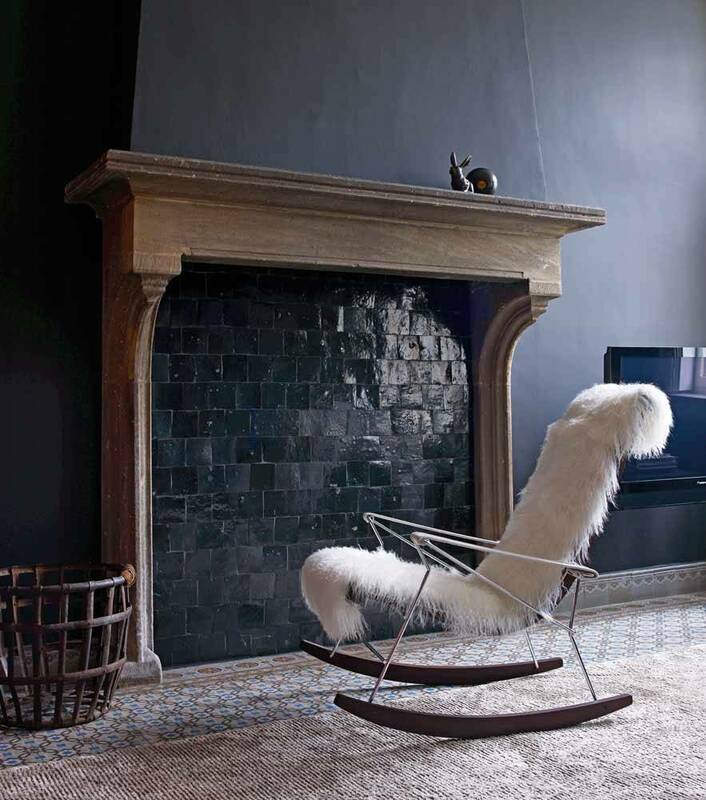 The Hauteville Rocking Chair can answer all those questions. Its design draws inspiration from mid-century pieces, being updated for a modern environment. The chair is built with rebar legs, plywood runners and a concrete shell and the result is an industrial piece with an unpolished look that somehow manages to be stylish and refined. There’s so much we like about the Mamulengo Rocking Chair that we don’t even know where to start from. The sculptural form of the chair is exquisite and the attention to detail but, most importantly, the idea at the base of the whole piece is so clever and so simple that it makes one wonder why it hasn’t been explored before. 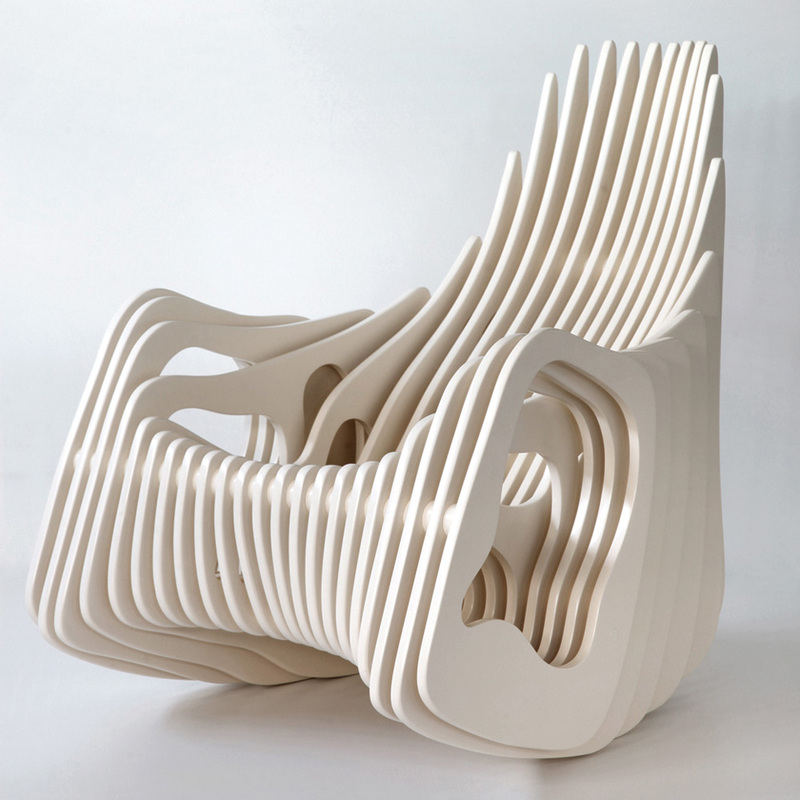 Designed by Eduardo Baroni, this chair is made of ivory plywood slices which seem to perfectly capture the rocking motion in freeze frame. 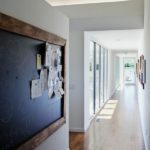 There are numerous ways of blending together the old and the new and the beauty of a design often lies in the way in which the styles interact with each other. Let’s analyze this rocking chair for example. 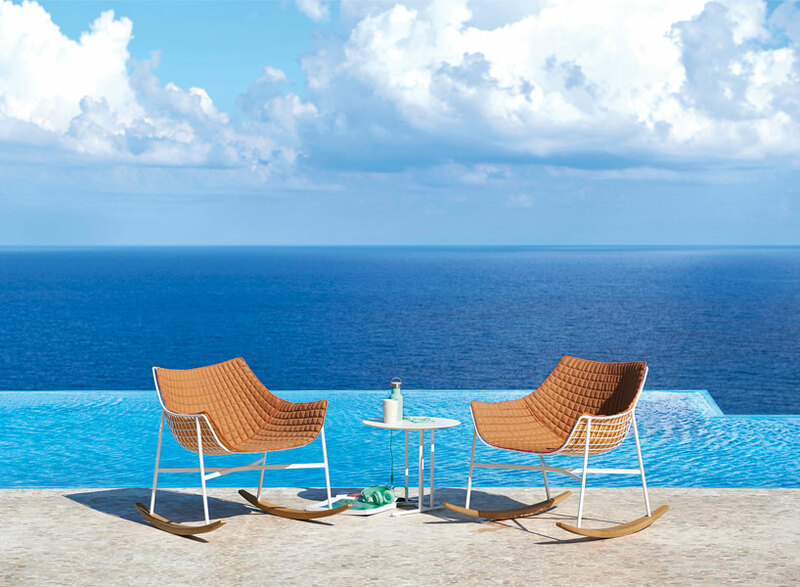 La Norestense is a piece that puts together a thin and slender metal frame and a shell that’s available in two versions: perforated steel mesh and weaved palm fabric, the latter being created by skilled craftsmen using natural fibers. The beauty of the design lies in the contrast between these elements. 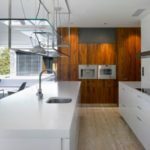 Two contrasting and very different materials, stainless steel and plywood, are harmoniously paired in a design that’s as elegant as it is simple. 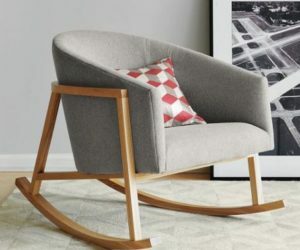 This is the Buttercup Rocker, a modern rocking chair that’s small in size and big in style. Its base is available in brushed stainless steel or powder-coated steel and the seat and back form a beautiful shell made of bent plywood. 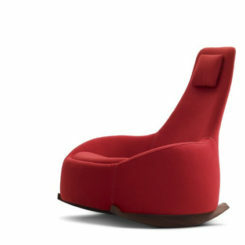 This is the Comeback Rocking Chair designed by Patricia Urquiola. It may not look that different from the old-school rocking chair grandmas used to love but if you look closer you’ll notice a bunch of details that make this piece stand out. It’s not just the architecture of the chair but also the combination of materials used, more exactly the pairing of plastic and wood. Cornelia is the type of modern rocking chair that was built on the framework of the rustic piece we’re all familiar with without making any drastic changes regarding the form and structure all while visibly updating the entire design. It became available in 2014 and it’s designed by Giorgio Cattelan. 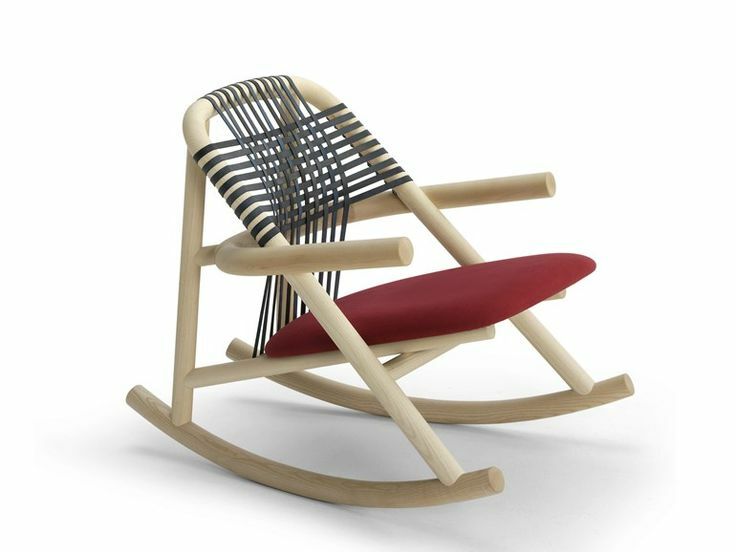 This is Piña, a rocking chair designed by Jaime Hayón. It’s a chic and stylish piece of furniture with a frame made of steel and two rockers made of solid ash wood which can either feature a natural or painted finish. The seat and back cushions are available with removable covers in fabric or leather. 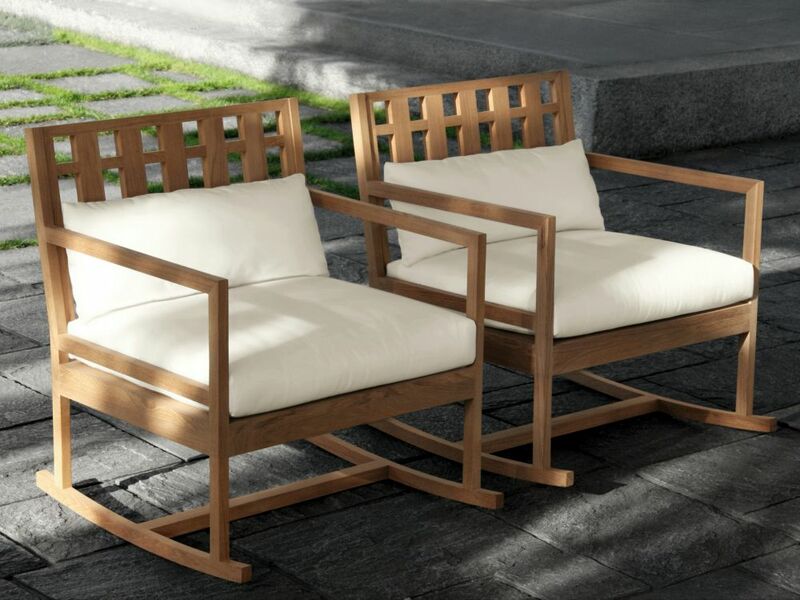 The rocking chair in the Square series, like all the other pieces in the collection, has a simple frame in teak wood and comfortable seat and back cushions in polyurethane and polyester fibre. The standard cushions are not waterproof so even this is an excellent chair for outdoor use, it needs to sit in protected areas. Nature is an infinite source of inspiration and the Elephant chair is one of the creations that showcase its beauty. 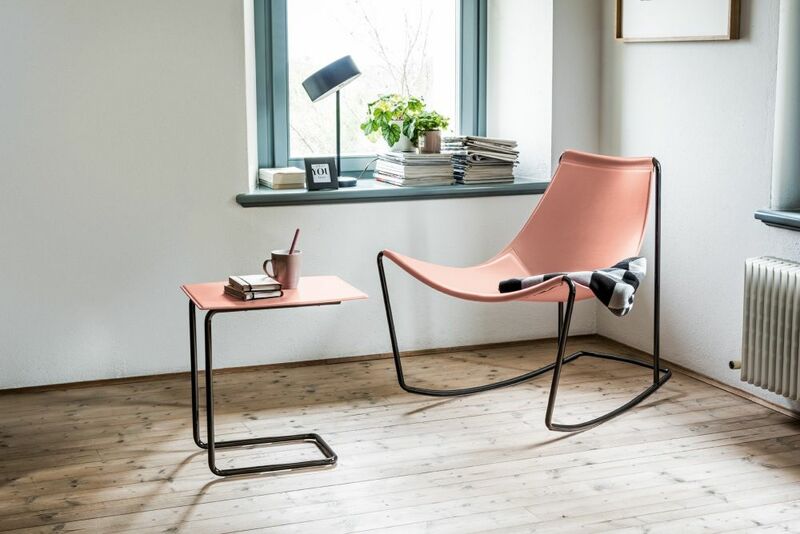 The rocking chair was designed by Neuland studio and puts together a metal frame with a wooden base with a raw, natural finish and a seat shell in hard polyurethane. 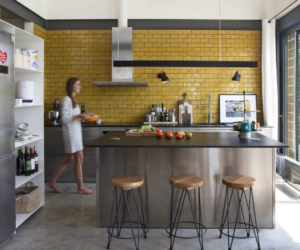 The design has a bit of Nordic charm without entirely falling into this category. 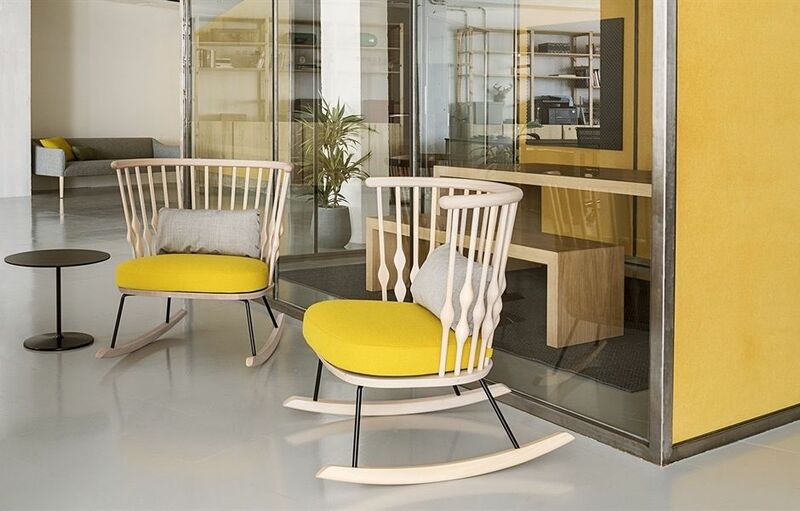 The Apelle rocking chair impresses with its sinuous and simple lines and the way it embraces its users, enveloping them in a delicate and comfortable way. 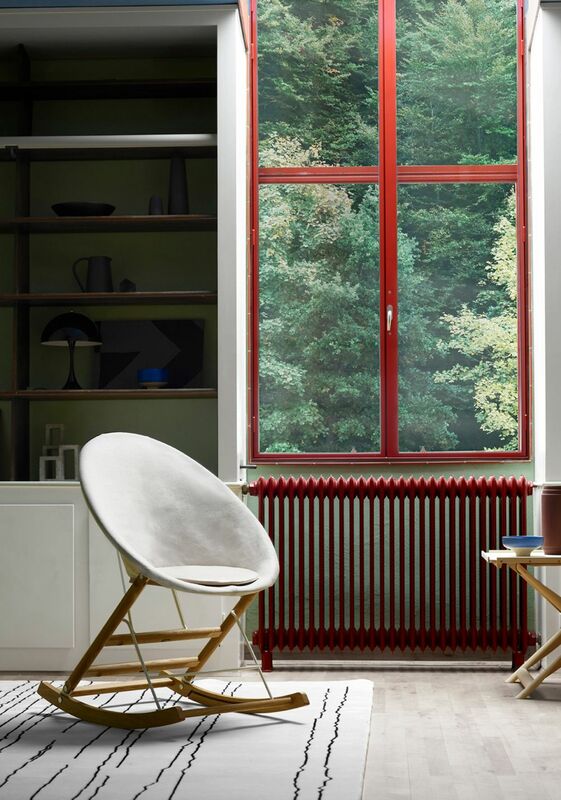 The design is both classic and modern, the chair being built with a steel frame and a leather seat shell. It’s part of a collection that also includes armchairs, lounge chairs, stools and matching tables. A lot of classic and consecrated armchairs and lounge chairs have been adapted and rocking versions of them have been created. The 500-series shell chairs designed by Geoffrey D. Harcourt are a good example. This is one of them with a rocker base. It’s incredibly comfortable and ideal for relaxing and lounging. 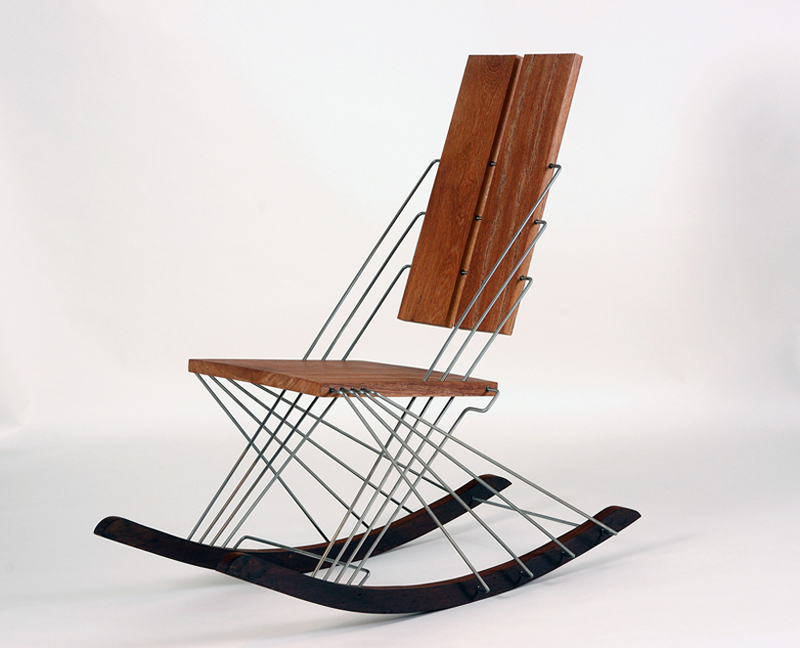 This is Tesa, a slender-looking rocking chair designed by Salih Teskeredžić. It’s infused with Nordic beauty and simplicity and puts an emphasis on the natural qualities and characteristics of the wood. There’s no back cushion, only a woven seat and the frame has a continuous and fluid form. Technically, this is not a rocking chair per se since you can’t really rock back and forth. There are, however, a few similarities between this chair and the rest of the pieces from the Stresemann collection. Their designs are inspired by the forms of aircraft wings. The frame has a very airy appearance while the seat and backrest provide maximum comfort and the armrests add a touch of style. 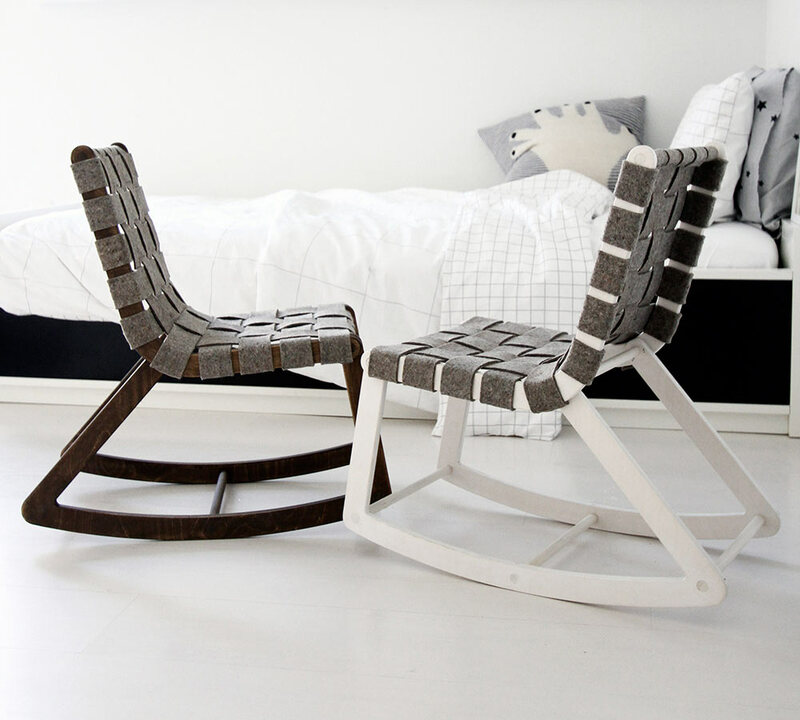 NAP is a rocking chair with a casual and laid back look that also manages to be elegant at the same time. 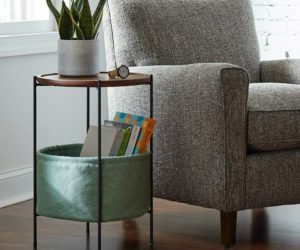 The rocking base combined with the soft and comfortable upholstery make this a perfect piece for reading corners but also for balconies, terraces, living spaces and pretty much any area with a nice view or a relaxing ambiance. 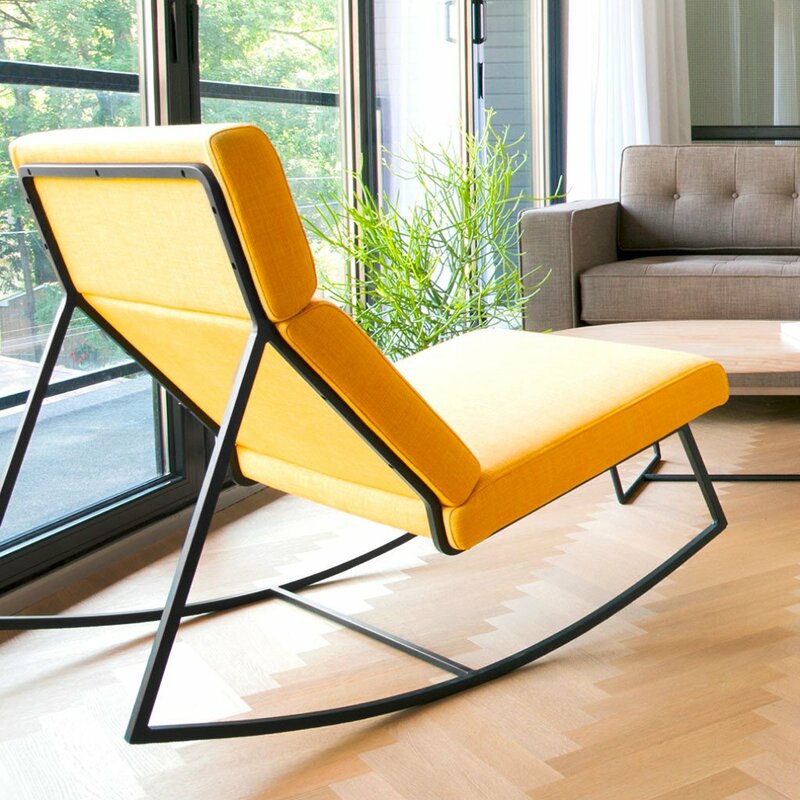 Called Mbrace, this modern rocking chair features a beautiful wingback design and a very comfortable seat that embraces the user and ensures a cozy and friendly experience. The frame of the chair is made of aluminum and the base which is the only visible part is made of wood. Unlike other rocking chairs, the Vis à vis has a very subtly curved base which makes this look rather like a club chair or just a regular outdoor armchair. The rocking motion is a very pleasant surprise. The wooden frame is almost entirely visible thanks to the woven seat and backrest design. It’s often the little things that make a design special. Take the Nub chair for example. 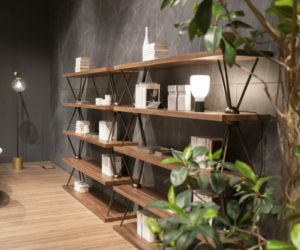 It looks interesting and stylish and this is an impression given by the harmony between all the elements including the rocker base, the slender metal legs and of course the curved backrest which features these thin, sculpted wooden rods that complement each other perfectly. 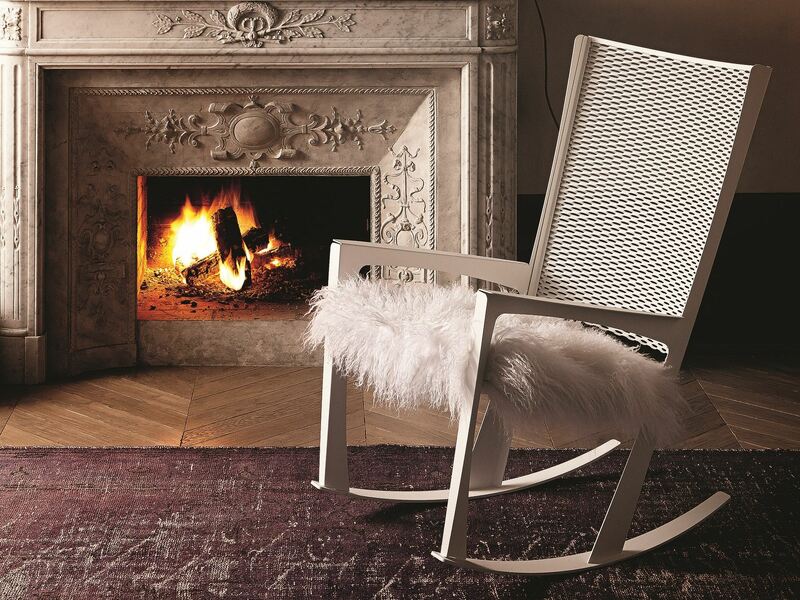 The design of the J.J. rocking chair is lightweight and airy and it’s all thanks to the choice of materials. 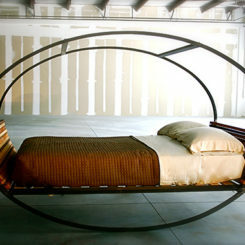 The frame is a combination of steel rods and wooden rockers. Although the design has a visible traditional influence, the overall look is a modern one. 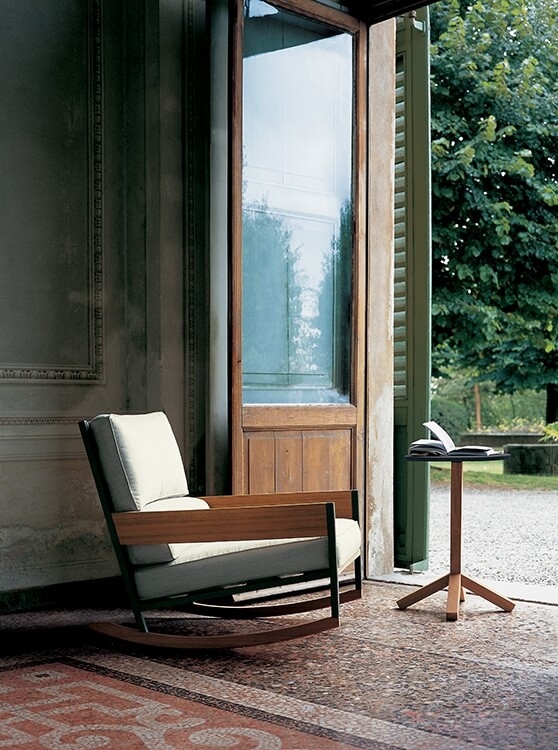 Linearity and simplicity are two important characteristics of the Landscape rocking chair. But the chair is not designed this way simply for aesthetic reasons. 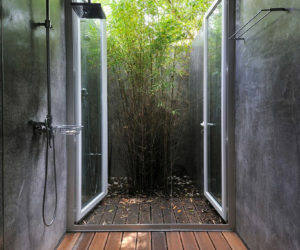 This is also a practical design meant to offer natural ventilation and to protect against rain and wind, all while being comfortable and good-looking. 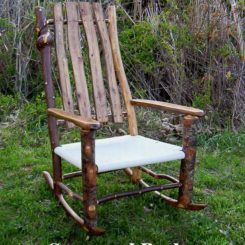 If this looks a lot like a rustic rocking chair, the type grandmas used to love, that’s because it was designed in 1944. This is Wegner’s rocker and its design was visibly influences by Windsor and Shaker furniture. We like its simplicity, high back and nostalgic appearance. No matter how you look at it and what color you choose, this chair looks like a Stingray. That’s only natural since that’s actually its name. 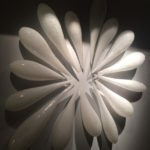 It was shaped after the poetic and elegant form of the marine animal and its shell is created using a 3D veneer press. 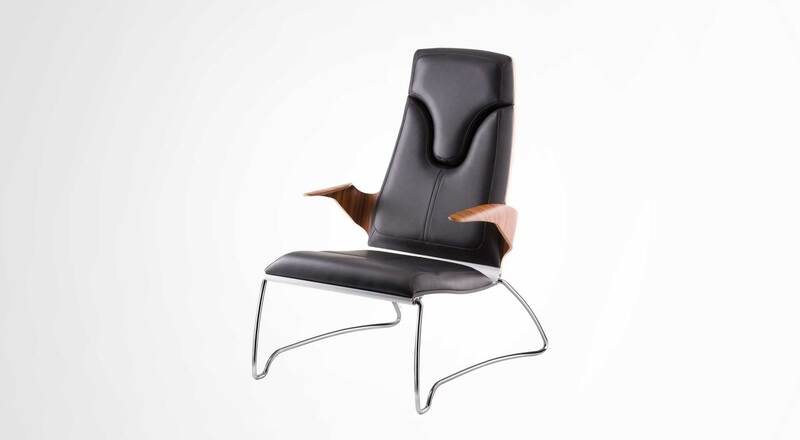 It’s then upholstered in leather in the same color as the slender metal base. The unusual and intriguing design of the Cowrie Rocker was inspired by seashells. This is actually a combination between a rocker and a lounge chair. 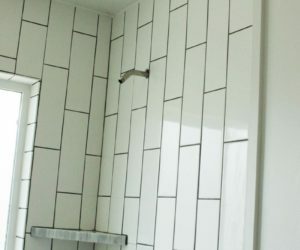 Its design is minimalist, eye-catching and sophisticated and can easily fit in just about any contemporary interior decor. The entire piece is made from a single sheet of plywood. 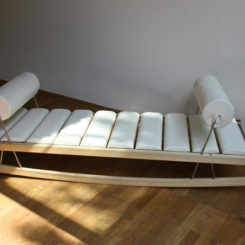 This is not a rocking chair but a rocking chaise longue. 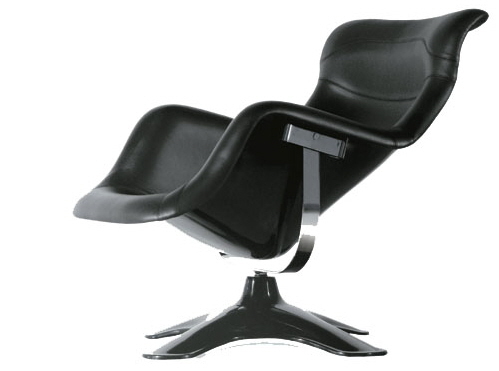 It’s the 837 Canapo by Franco Albini. Its frame is made of solid ash wood and walnut with polyurethane cushioning and fabric or leather upholstery. the elements are connected with cords.